Curved plywood stool with 3 leg base, available in the natural oak and black finishes. It is provided with glides with felt insert for wood floors. Height 44 cm - 17 3/8"
Stool with structure in solid maple or ash. Maple veneer, oak veneer, walnut or wenge; Internal support in injected polyurethane foam. Finish in colored stains in various colors. Nature at itspurest: Stoolis a 45-cm-diameter log, hand-crafted to create a comfortable chair and a sense of warmth. Stool adjusting in height with base in poliurethane Upholstery in sky. Stool, base in aluminium brillant, upholstery in sky, back in glazed plexiglass. Soft-touch covered pouf with decorative seams and chromed legs. A stool is a seat or foot rest which has no armrests or backrest. It can be low or high, upholstered or hard, and may be mounted on a pedestal or on legs. Some pivot or roll on wheels, while others fold or stack. A padded footstool is sometimes called a pouf or an ottoman. ArchiExpo characterizes this furniture by properties such as style, use or material. A low stool can serve as convenient extra seating indoors or outdoors. Some are used to facilitate bathing, for storage or as a low table. 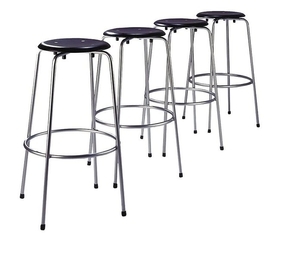 High stools are designed for use with high tables and bar tables. Many such models have a footrest or pivot. This furniture can be made of a single material, though many use a combination. Frames, legs and bases are often of tubular stainless steel, aluminum or wood. Wood and thermoformed plastic are commonly used for the seat. When choosing, consider seating comfort. Stackable or modular versions are easier to store and present advantages if the stool must be moved often. Proper height and sufficient leg room are important for those used with tables. A stool can blend into its surroundings, or can be a playful design piece which stands out and adds originality to a space.